Enjoy the beauty of the outdoors from the comfort of your home with sliding patio doors from Window World of Long Island. Meticulously crafted for an upscale appearance, each door boasts a powerfully protective and weathertight infrastructure to keep you and your family safe from inclement weather. Specific styles are available with plated hardware and between-the-glass mini blinds for your personal privacy. With a broad range of innovative functionality, energy efficient benefits and award-winning style, Window World sliding patio doors offer the material and performance to match your needs and budget. Check out the options below to find the series that works best for you and your home. 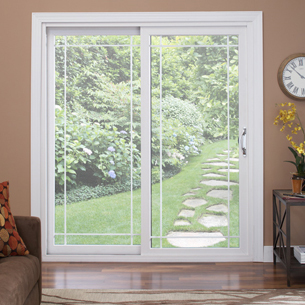 The 4500 Series Patio Doors not only open up living spaces in your home, they also perform like no other. Equipped with fusion-welded sash panels to efficiently keep air and water from infiltrating the home. The double-strength 3/4” tempered insulating glass provides endless strength to multiply its overall performance. Mini blinds not offered for this series. The vinyl threshold is easy to clean and maintain. Multi-point lock secures door at multiple points with one handle. Steel lock & strike plate provides long-lasting performance. Patented, dual-tandem nylon wheels on a raised rail protects the wheels from dirt and debris and minimizes friction. Heavy duty aluminum screen frame is designed to reduce binding and maintain effortless operation. Galvanized reinforced Steel sash profiles with 12-gauge steel helps create a strong and resilient unit. Chambered profiles with honeycomb chambers throughout the vinyl act as pockets of insulation to increase thermal efficiency. Equipped with durable vinyl profiles and advanced energy efficiency, the 6500 Series was built for high-performance in all climate seasons. Operating with finger-tip ease, Window World Patio Doors feature a variety of decorative options to blend with any home style. Between-the-glass mini blinds for your personal privacy are available with the 6500 Series in six different colors. Chambered rails reduce thermal exchange and increase insulation values – without adding costly, less recyclable insulating material. Multiple weatherstripping help blocks most outside noise. 3/4” double strength insulating glass unit multiplies the overall performance. Fixed & mobile panel rails meet and interlock perfectly, making removal from the outside almost impossible. Lower sill design provides safer entry and exit. Multipoint steel locking mechanism provides optimum resistance to forced entry. Smooth and quiet operation patented dual-tandem nylon wheels on a raised rail protects the wheels from dirt and debris, minimizes friction and makes for a smoother operation. Heavy duty aluminum screen frame reduces binding, creating effortless operation. Not shown. Ready to upgrade your home’s patio door? Call us today for a free home estimate to get started!